Asiatic acid (AA), a triterpenoid present in Centella asiatica, possesses the ability to cross blood brain barrier and received considerable attention for its neuroprotective role. We have reported the benefit of AA against aluminum chloride (AlCl3)-induced amyloid pathology, enhanced acetylcholine esterase (AChE) activity, and inflammation in Alzheimer’s disease (AD) like model rats. Based on that, to find the exact mechanism of action of AA, the present study was designed to evaluate the oxidative stress, tau pathology, apoptosis, and Akt/GSK3β signaling pathway on AlCl3-induced neurotoxicity in Wistar rats. AD-like pathology was induced by oral administration of AlCl3 (100 mg/kg b.w.) 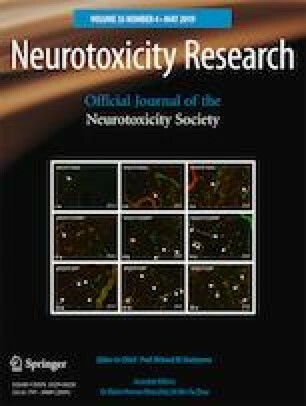 for 6 weeks, which demonstrated a significant reduction in spatial memory performance, anxiety, and motor dysfunction and diminished the expression of cyclin-dependent kinase 5 (CDK 5-enzyme implicated in the phosphorylation of tau proteins), pTau, oxidative stress, and apoptosis, whereas oral ingestion of AA (75 mg/kg b.w.) for 7 weeks attenuated the above-said indices, which could be by activating Akt/GSK3β pathway. Current results suggested that AA could be able to modulate various pathological features of AD and could hold promise in AD treatment.